Today’s featured plant is Albuca spiralis – a really unusual, lovely and rare plant that is in my wish list for a long time. This small and unusual species is a bulbous plant from the family of Hyacinthaceae and is loved for its unusual spiral leaves that remind us of the Spiral Grass plant. 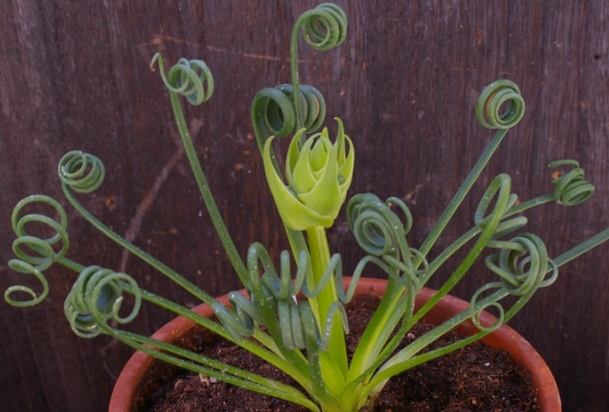 Albuca spiralis grows as a winter growing plant and produces wiry leaves that curl themselves into the shape of the corkscrew especially when grown in dry winters and provided with a sunny exposure – more sun, more curls. Flowers of Albuca spiralis are rather inconspicuous; the bell-shaped greenish-yellow flowers appear in late winter and continue to bloom till spring. As the summer sets in, the plant goes dormant. The spiral leaves disappear at this stage and the bulb shows no sign of life. At this time, the plant needs barely sufficient water. Watering can be started in early winter when the plant shows signs of life. Albuca spiralis can withstand light frost thus it can be grown in the ground in areas where winter is dry. In colder climates, Albuca spiralis can be grown in pots. The plant is fairly easy to grow as long as it is grown in a fast draining soil and protected from overwatering.